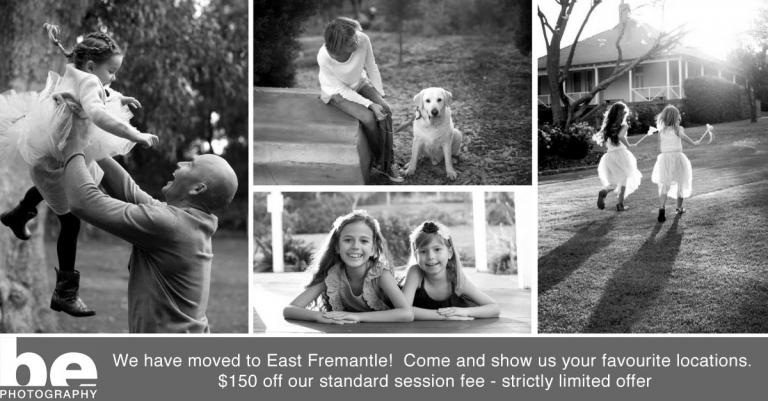 We’ve recently moved into East Fremantle, and a new home opens up a world of new shooting possibilities! The best way to discover some local treasures is get some local families to show them to me, of course! So, if you live locally to the area, from Fremantle, to Applecross, and anywhere in between, we’d love to hear from you. Maybe you have a favourite park you visit with the kids? Or perhaps you have found a nice secluded spot on the river that you call your very own? Or you’ve finished a renovation on your lovely home, and you’d love to capture the family at play there? Whatever it is, wherever it may be, we want to see it! We’re waiving our usual $150 session fee for just five families, in return for showing us their local treasures. If you’ve love an update of your family portrait and would like to take advantage of this offer, please complete the expression of interest form below. We’ll be in touch within 24 hours to confirm whether your application was successful. Our usual session fee will not apply to these sessions, you will simply need to purchase any images you fall in love with. Our full price list is available HERE for any purchases you may wish to make.